After thousands of years in a state of wandering statelessness, the modern state of Israel came into existence in 1948. A simplified narrative follows with Jews immigrating to the new nation-state after having had endured the atrocities of the Holocaust. But in turn, the Jews displaced the native Palestinians. Wars and territorial conquests followed with Israel seen as a bulwark of democracy against the assembled tyrannical Arab states. This simple narrative captures the major brushstrokes and the common themes of endurance, oppression, and displacement. The broad categories of “Jew” and “Arab” help give outside observers a simplistic interpretation of historical events. But simplicity is a double-edged sword. Terms reveal as much as the hide. History is about setting down a record for posterity, but at the same time engages in the deceptive task of erasure and obliteration. 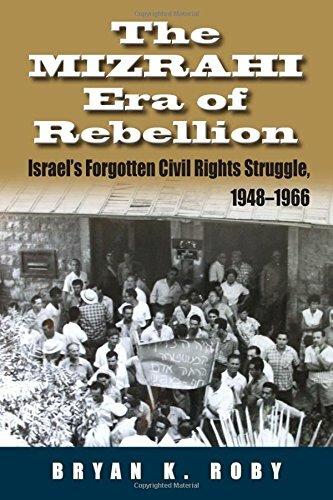 The Mizrahi Era of Rebellion: Israel's Forgotten Civil Rights Struggle 1948–1966 (Contemporary Issues in the Middle East), by Bryan K. Roby seeks to complicate this simplified vision of Israeli history. The Mizrahi Era of Rebellion highlights the struggle of Mizrahi Jews prior to the Six-Day War of 1967. The clash between the Ashkenazi and Mizrahi Jews can be seen as a struggle between races and ethnic communities. After the Second World War, Eastern European Jews (the Ashkenazi) settled in Israel by the thousands. Shortly thereafter, Middle Eastern Jews (the Mizrahi) also settled in Israel. The Mizrahi (or, to use Roby's terminology, Oriental Jews) were an ethnic majority. Despite having a majority population Oriental Jews faced prejudice, discrimination, and police harassment from the Ashkenazi elite. It wouldn't be until the Six-Day War that the Mizrahi would be seen as equal compatriots. For his research, Roby used two main primary sources: police reports and newspapers. He is upfront about the opportunities and shortcomings of both sources. The challenge includes collecting enough data on specific altercations and arrests. If a protest is nonviolent, newspapers have a tendency to not report on such incidents. But police reports are hardly bastions of objective interpretation. Roby investigated primary sources written in Hebrew, Arabic, French, and English. During this time period, Oriental Jews were settled in ma'abarot (singular ma'abara), a temporary immigrant camp. They came from all across the Middle East, from Morocco to Egypt and Iraq. The plan involved the Mizrahi becoming part of the Israeli state through a process of cultural assimilation (mizug hagaluyot, literally “integration of the exiles”). Ideally, mizug hagaluyot was supposed to act as a melting pot with everyone, regardless of national origin, becoming an Israeli. In real terms, it meant abandoning any remnant Middle Eastern cultural identity. The Ashkenazi elite wanted to turn the Oriental Jews into European Jews. This process met with resistance from the Oriental Jews. One of Roby's key assertions, going contrary to the current historiography, is that the Oriental Jewish community was more active in its resistance than previously thought. Current scholarship saw the Oriental Jewish community as passive agents in their struggle for equality. “However, because of the Wadi Salib neighborhood's primarily Moroccan immigrant population, some scholars even go so far as to push the date of the beginning of a meaningful, unified Mizrahi struggle to as late as the 1980s.” Roby corrects this misreading by detailing demonstrations as far back as the 1950s. A critical aspect revealed in Roby's book is the Ashkenazi-Mizrahi conflict seen through a racial lens. The Ashkenazi elite wanted to preserve the European nature of Israel, often seeing Oriental Jews as unsophisticated, prone to crime, and destined for unskilled manual labor. Roby cites Indian Jew A. I. Macmull's scathing rebuke of Israel's assimilation policy. Macmull writes, “Apparently, European culture itself constitutes the 'melting pot' and all other cultural forces are expected to dissolve in it.” In Israel, White Jews ruled over Brown Jews. By the 1960s, many Oriental Jews who grew up in the ma'abarot refused to take the state's discrimination sitting down. Influenced by the non-violent demonstrations by African American civil rights crusaders, they took to the streets and demanded an end to the hypocrisy and injustice meted out to them. Due to the Cold War, Israel saw these demonstrations as threats to national security and possibly Communist-inspired. Blaming Communist infiltration was a useful canard across the globe, from the United States to South Africa. While Roby's coverage of comparative global movements is superficial, he calls for increased study in this area. The Mizrahi Era of Rebellion offers an academic prologue to future academic scholarship. With an able hand and a confident handling of primary sources, Roby has teased out fascinating parallels and hidden testimonies in the complicated and fractious history of Israel and the Middle East.